The International Atomic Energy Agency (IAEA) released on November 16, 2009 its latest report on the implementation of NPT safeguards in Iran and the status of Iran’s compliance with Security Council Resolutions 1737, 1747 and 1803. 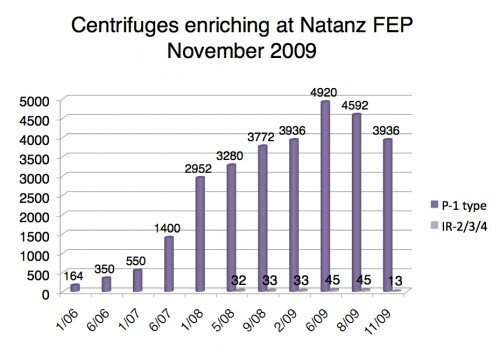 As of November 2, 2009 the number of centrifuges enriching uranium at the Natanz Fuel Enrichment Plant (FEP) has declined again, this time to 3,936 (the same number that were enriching in February 2009). 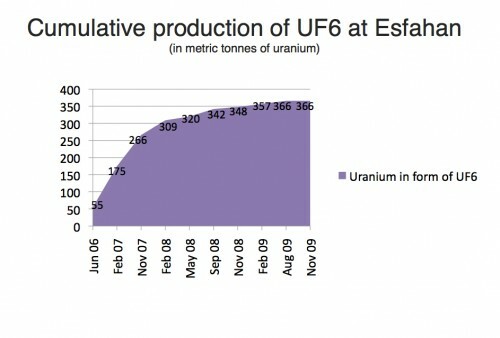 This represents a fifteen percent decrease in the number of centrifuges enriching compared to August 12, 2009, when the IAEA last publicly tallied the number centrifuges enriching. Iran has another 4,756 centrifuges which are not being fed with uranium hexafluoride, bringing to 8,692 the total number of centrifuges either enriching uranium, under vacuum, or installed at the facility, up from 8,308 at the time of the August report. During the most recent reporting period, from August 1 to October 30, 2009, Iran produced a total of 255 kg of low enriched uranium (LEU) hexafluoride, bringing its total to 1,763 kilograms of LEU hexafluoride. The average daily rate of LEU production has increased to 2.8 kg per day, up slightly from its rate of 2.75 over the two previous periods.1 Because this LEU is being produced in 656 fewer centrifuges (a reduction of 15 percent), Iran’s P1 centrifuges appear to be operating more efficiently than in previous months, although little information is available about this subject. The IAEA conducted a “design information verification” (DIV) inspection of the Fordow Fuel Enrichment Plant (FFEP) on October 26 and 27, 2009, which is located some 20 km north of Qom. The IAEA reported that Iran stated that no centrifuges had been installed in the facility, and, likewise, no nuclear material had been introduced. The IAEA verified Iran’s declaration that the facility was designed to hold 16 cascades of approximately 3000 P-1 centrifuges, though Iranian officials noted that the plant could be reconfigured to hold centrifuges of a more advanced design should such a decision be taken. Iran stated that the facility will be operational in 2011. Iran declared that construction of the Fordow facility started in the second half of 2007. However, the IAEA has not confirmed Iran’s chronology of the site’s construction. Member states have alleged that construction of the centrifuge facility started earlier, at least back in 2006. An ISIS analysis of satellite imagery indicated that construction of the enrichment facility would have begun by the first half of 2007 at the latest, and previous media reporting cited a 2006 start date to construction as well. The original structures built over top of the tunnel entrances were present in satellite imagery from 2004 and 2005, and the Associated Press reported that the construction of these buildings began in 2002. Since these structures were present at the same location perhaps as far back as 2002, Iran should provide documentation to the IAEA to support its declaration that construction of the enrichment plant did not begin until later. Of note, the IAEA stated that it still had questions about the purpose of the facility and how it fit into Iran’s nuclear program. For example, why would Iran need to build a pilot plant with only P-1 centrifuges, given its capability at the Natanz site. Furthermore, Iran stated that the site was being built in case the Natanz site were bombed. However, in the event of an attack on Natanz, the Fardow plant would likely then have been used to make weapon-grade uranium for nuclear weapons rather than LEU for civil purposes. LEU production would hardly be expected to be a priority during a time of war. The IAEA reported that Iran’s declaration of the facility “reduces the level of confidence” and “gives rise to questions” about other nuclear facilities that may yet be undeclared. Iran replied that no additional facilities were currently under construction or in operation that have not been reported to the IAEA. But the IAEA stated it wanted that assurance in writing that it had not taken a decision to construct, or to authorize construction, of any other nuclear facility that had not been declared to the IAEA. The IAEA reports no progress with Iran in addressing outstanding issues related to “possible military dimensions” of Iran’s nuclear program and continues to await Iran’s reply to overtures for information about its alleged activities. Given that Iran’s answers could significantly reduce suspicions about its past activities, its lack of cooperation is perplexing, at best. During a DIV at the Esfahan plant, IAEA inspectors found 600 50-liter barrels of heavy water, which do not appear to have been produced at the Arak heavy water production plant. Iran likely imported this large quantity of heavy water secretly; inspectors are seeking more answers about the origin of the heavy water and when it was obtained. The material was found in a part of the uranium conversion facility that is not regularly visited by the IAEA. Under the United Nations Security Council resolutions, the IAEA is required to report on any heavy water related activities. The discovery of this heavy water, while not discussed at length in the report, again raises whether Iran has declared all its nuclear facilities and materials. 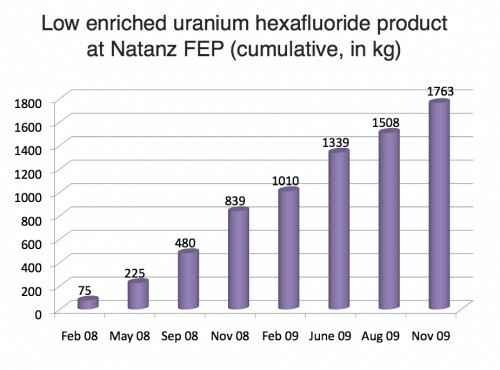 1From June 1, 2009 to July 31, 2009, Iran produced 169 kg of LEU hexafluoride, corresponding to approximately 2.75 kg per day of LEU hexafluoride.